...a straightforward and honest venture capital partner! We see ourselves as the ideal partner for sustainable businesses by contributing capital and expertise. Investo Capital has a strong network including national and international investors, business angels and experts from the industry and knowledge institutions. Doing business with us simple and straightforward. With our investment capital, we support your company’s growth; our team is ready and at your disposal at any time. We want our portfolio to be - and feel - selected. Investo Capital is a Danish venture capital firm based in Aalborg. We invest in carefully selected Danish early-growth companies within tech business areas in the broad sense. We look for companies that can scale globally and where we can add value while helping to provide great exit opportunities within approximately five years. With your technology-oriented Startup, you are now planning to increase the size of the company! Do you need strategic and financial support to realize your business ambition? If that is the case, then you should contact us. With our experience in all aspects of how to improve value in a tech-Startup, we offer tailor-made participation and assistance in addition to the investment itself. Our target group is innovative companies with proof of business, strategic thinking and strong growth prospects in Denmark. For us, strategic corporate concepts and competent management are essential features – We will participate with companies who are in a convincing competitive position. It is at the core of our objectives that the Startup continues as an independent company, but when we get involved it becomes a company where the different owners build a partnership in order to enlarge the overall value to the benefit of all. We invest in people and business models as integrated investment criteria. The entrepreneur pursues the Startup’s growth objectives, and we provide our investment and expertise to provide business advantages. Our investment focus is Technology, IT, SAAS- and med-tech. It lies in the nature of our collaboration that our offices and the Start-ups, we invest in, do not live door to door. These challenges of collaboration are amplified, when employees work in multiple locations. However, we aim to co-work like a combined unit or a single entity: two or three united companies functioning as a single unit. Joint mission is the well-being and growth of our common company. During this journey, we are bound to experience ups and downs, but the unity shall be the power which bring us forward. All the above stated is why we have chosen Unite as one of our core values. Exit strategies related to Startup funding are quite often misunderstood. The “exit” in exit strategy is for the money, not the Startup founders or small business owners. Startups looking for angel investors or venture capital (VC) definitely require an exit strategy, because investors require it. The exit is what gives them a return. And for the those who are starting, running and growing a business, but not looking for outside investors, they will probably need an exit eventually; but there’s probably no rush. Investor exits normally happen in only two ways: Either the Startup gets acquired by a bigger company, for enough money to give the investors a return, or the Startup grows and prospers enough to eventually register for selling shares of stock to the buying public through a public stock market. Together, we will define the exit strategy and timing. During the exit process, we will provide support and expert assistance and ensure that it will be a mutual success. We have built a strong team, guided by experience, energy, availability and integrity. Jesper is the senior member of our team and has a huge experience from both European and US markets. Jesper has been counseling start-ups for more than 15 years, and has made some of the most successful scale-ups possible within NOVIs portfolio. Jesper has a natural interest in arts and society matters. Previously, Jesper has worked as a CPA, later as CFO with SONOFON (Telenor) and CEO of NOVI A/S. Tobias is 24 years old and studying a master’s degree in management accounting and control at Aalborg University. He contributes with the latest knowledge and theories from the academic world. Previously, Tobias has worked as a data analyst at Region Nordjylland. Privately, he has a great interest in football. Thor is located in Copenhagen and has a long experience within Nordic venture capital and private equity. He has been handling portfolios for approximately 20 years and has a long track record of successful investments. 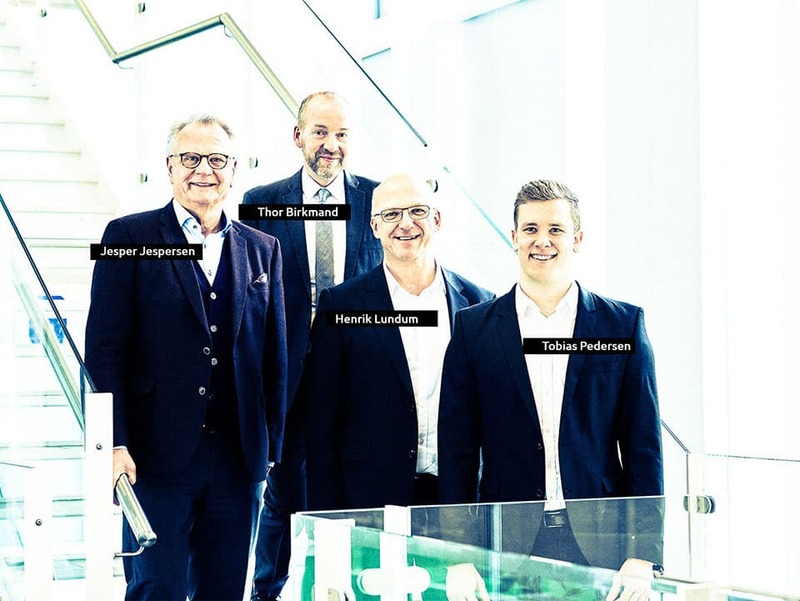 In addition to Nordic private equity, Thor has 10 years of experience in technology, business development and management, including a position as managing director of IconMedialab, where he built up the Danish operations from scratch. His other engagements include product and marketing management with convergence products with the Danish mobile operator Sonofon. Thor is 49 years old, holds a Bachelor and a Diploma in Economics and Business Administration from The Copenhagen Business School and an MBA from SDA Bocconi in Milan. Privately, he has a substantial in architecture, design and music. Henrik is an entrepreneur by heart. He has been involved in 9 start-ups until now, all of them still in business. Henrik holds a number of positions as Chairman of Board of Directors. Henrik’s network reaches far and he has been involved in business relationships throughout more than 30 countries. Henrik is 50 years old, holds a graduate in Financial and Management Accounting, including Marketing Management and an Executive MBA in Strategy. Privately, he has a vast interest in music and music history. Henrik is also the CEO of NOVI A/S and NOVI Innovations A/S. The name of the company is no coincidence, as pointed out by Heartland’s CEO Lise Kaae: “We do not venture into business opportunities without having our hearts in it, and we only look for long term engagements. In that sense, our investment view is very much affected by the Holch Povlsen family values. NOVI is one of Denmark’s most innovative science parks, in which more than 1,000 employees divided between 100 companies work alongside each other every day to create an office and research environment, which can bring together new ideas, networks and innovation. Regardless whether you have just set up your business, or you are already well-established, we put a reliable full-service office environment at your disposal and present you with a tailored solution to match your needs. TracInnovations provides motion tracking and monitoring for MR scanners in hospitals and clinics. The innovative markerless solution improves image based diagnostics and treatments, and reduces the need for sedation and rescans due to patient movement. You can contact any member of our team by phone or e-mail, or please feel free to send us your pitch-deck here.